← Should I install vinyl windows in cold weather? 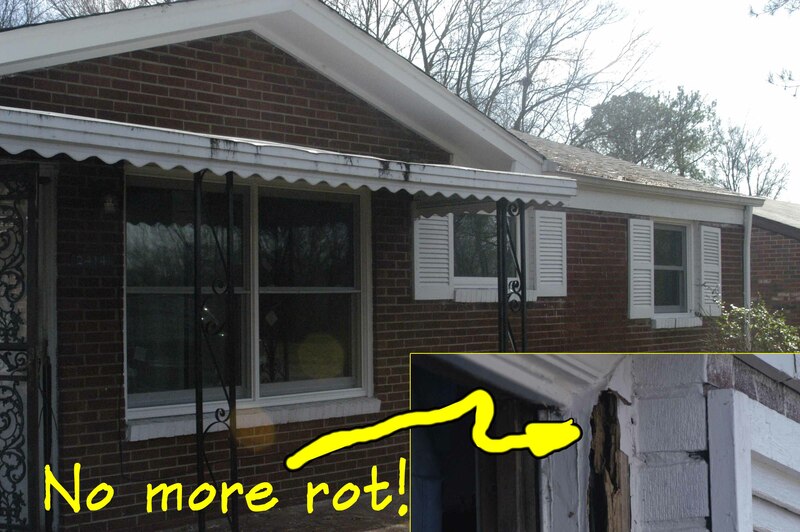 Why on earth would you replace your old drafty wood windows and leave the old rotten sills and mainframes in the home? The answer to that question is two fold: 1) because that is the way we have always done it, and, 2) because it is cheaper to replace the windows the old way. But for those that want a better solution, read on. Typically the rot is covered with thin aluminum capstock that only hides the problem. Did you know there is an alternative to the “pocket window” in which only the sashes are removed and the rotted mainframe is left in the window to continue to rot beneath the surface? Look at the upper left of Figure 1. Do you want that left in your home? Now you don’t have to with the “Total Tearout solution”. Below is a collage of activity which further shows the advantage of the “Total Tearout”. 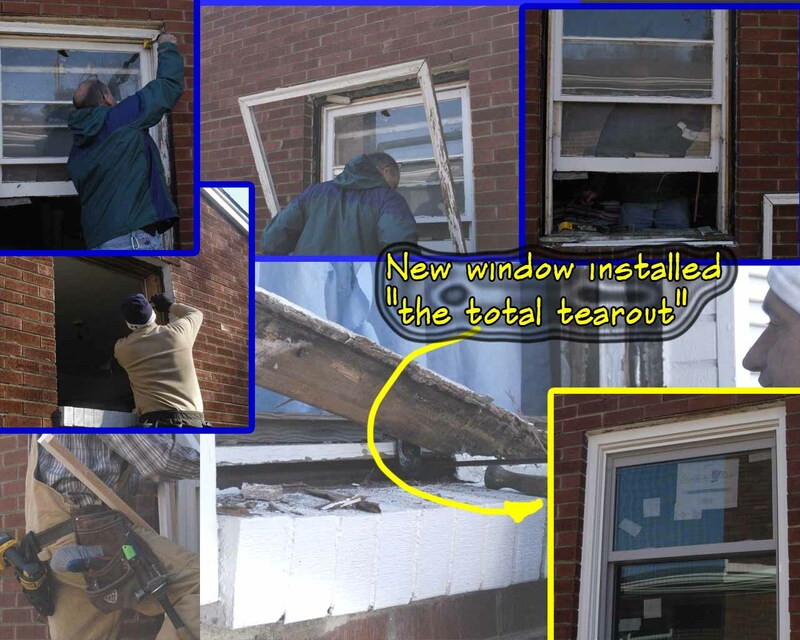 The orginial window in Figure 2. was removed and installed in less than one hour. As a matter of fact the motley crew in Figure 3 which consists of Caleb Moris, saleman for MGM; Ryan Blankenship, MGM paint supervisor; William Brewer, MGM’s chief service technician; and Joe Gaskins, MGM’s Vice President of Sales. Not pictured is Abe Gaskins, MGM’s President, who added about 2 hours of labor to the job. Figure 3. This–admittedly seasoned and professional crew–replaced nine windows in the above house in 4.5 hours. Total Man-hours on the job was 20 hours. They were on the jobsite at 9:00AM and left a cleaned up jobsite at 12:30PM. If you do the math–that’s 2.2 hours per window. 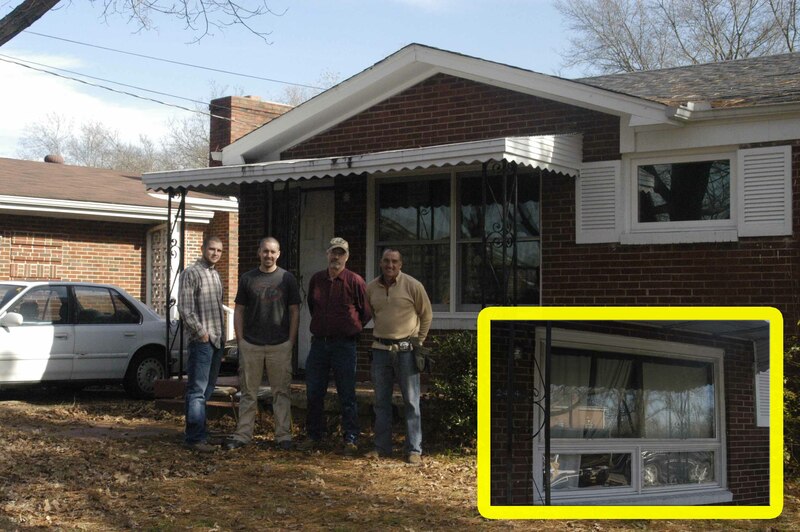 The inset picture within Figure 3. shows the original ugly window that was in the home behind the installation team. Note how you can totally change the look of the home from a dated 1960’s motif to a 21st century look. Figure 4. Figure 4. just shows more of the installation process. In this figure we removed the brick mould first and then snuck the window out of the opening without disturbing the inside trim. If we had been more aggressive I’m sure we could have reduced our Man-hours/window. This was the first job we did as a team. Like everything else, the next job will be faster because we will get the “muscle memory” down pat. Call Joe Gaskins if you want to get into a niche that nobody in the vinyl window industry is targeting. In Figure 2. you can see a mock-up of our first cellular PVC trim that we will be extruding in-house in the first quarter of 2012. Caleb Morris is a member of the MGM “A” team–click here to learn more about the MGM “A” team. This window solution is the first real break-through for the 21st century. For more on the MGM 8017 Double… MGM-8017-DH. At MGM Industries the owners are hands-on people, who have worked in the field and understand the needs of the industry. For the best windows and doors–CAll MGM! Here is a good video that I found on YouTube on the “Total Tearout”. This entry was posted in Green Technology, Painted Vinyl Windows, PolyVinyl Chloride (PVC), Vinyl Windows, Window Manufacturing. Bookmark the permalink. 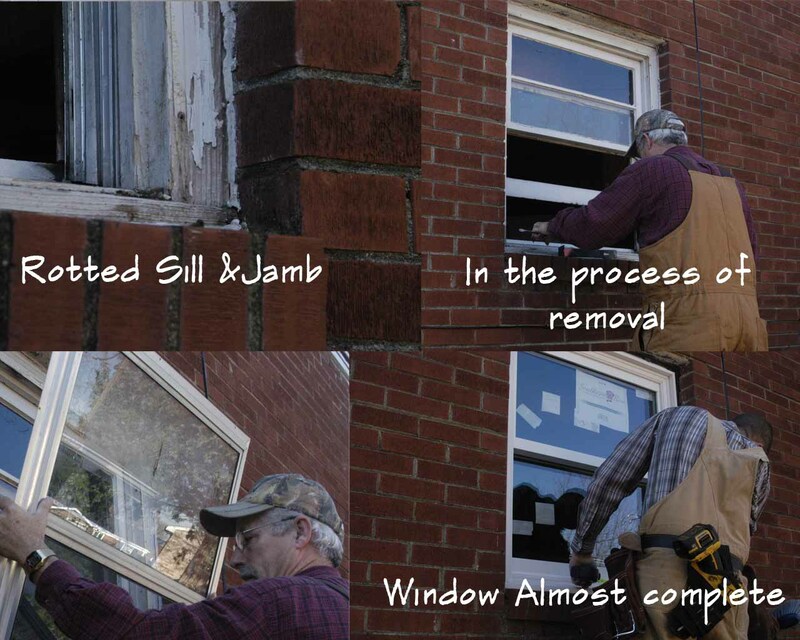 I install about 1,000 replacement windows per year in the Middle Tennessee area. I have installed your windows in the past while working with Alfred Lawless. 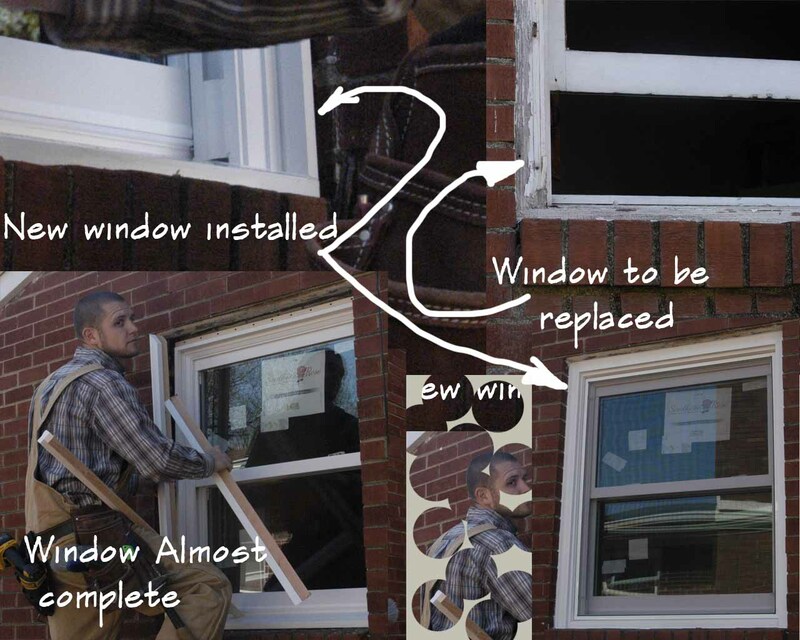 I would like to get more information on your Total Tearout windows as I believe this is a better long-term solution than the traditional pocket replacement with aluminum wrap. Hi my mother in law just gave us a house and the window sills in the up stairs are horrible. I just found your windows on here and fell in love. My question is do you sell to the public.I am very interested in the total tear out of all wood including the sill and these windows are perfect for what im looking for.